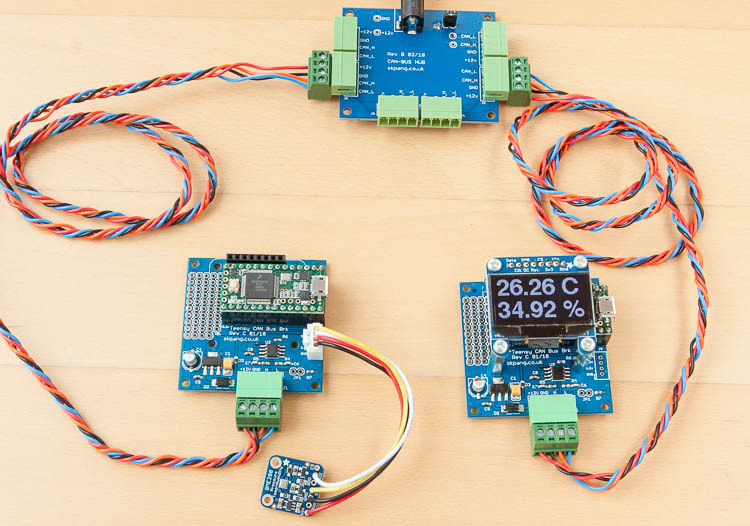 This project uses the Teensy 3.2 with the BME280 temperature and humidity sensor. The readings is transmitted over CAN-Bus. A remote display also uses the Teensy 3.2 displays the reading on a 128x64 OLED screen. Teensy 3.2 reading a BME280 sensor, reading transmitted over CAN-Bus and displayed on an OLED screen. The sensor is the BME280 manufactured by Bosch. It is connected to the Teensy via the I2C bus. BME280 sensor connected to Teensy 3.2 via I2C. The remote display also uses the Teensy 3.2. A 128 x 64 OLED screen is used to display the values. The screen is connected to the Teensy via the I2C bus. Source code for both board is available from Github.